A tract published in 1347 entitled The III Consideracions Right Necesserye to the Good Governaunce of a Prince was of the opinion that a queen should ‘have good and due regarde to suche thinge as toucheth the profyte and the honeure of hir lord and hir self.’ The queen should obtain her husband’s consent before she took in hand ‘greet maters’, for her primary duty was to ‘bere reverence and oneure’ to her husband ‘at all tymes.’ It can be argued that the fourteenth-century consorts Philippa of Hainault and Anne of Bohemia, wives to Edward III and Richard II respectively, were successful in heeding and responding to the expectation put forward in The III Consideracions. Intercession and motherhood were central to this conceptualisation of what it meant to be a successful queen consort in late medieval England. The Game and Playe of the Chesse , William Caxton’s 1474 translation of the thirteenth-century work authored by Jacobus de Cessolis, noted that the queen ‘ought to be chaste, wyse, of honest peple / well manerd and not curious in nourisshynge of her children’ and in temperament, she should be ‘tymerous and shamefast.’ To be a successful consort, then, was to be virtuous, chaste, polite and modest; she was responsible for providing heirs to safeguard the continuation of her husband’s dynasty, and to prevent the outbreak of dynastic and political conflict that could accompany a disputed succession. Philippa of Hainault’s Coronation, Jean Froissart, 15th century. the support of Edward’s political enemies and made possible his deposition. Whether or not he was ultimately murdered in 1327, as is traditionally argued, Isabella had demonstrated the possibilities available to a consort to exercise public power at a time when the queen’s ability to do so was highly circumscribed, and when she chiefly did so through informal – or ‘private’ – means. Philippa, therefore, did not necessarily find herself in a straightforward position when she became England’s queen in 1328. The ambiguity of the situation facing her is perhaps most strikingly demonstrated by the fact that she was not crowned until the spring of 1330. This ritual, which legitimated the queen’s position and celebrated the ruling dynasty, was usually scheduled to take place immediately after the royal wedding, but in Philippa’s case it was delayed. The lack of clarity concerning Philippa’s role, and more broadly speaking the institution of queenship, was further demonstrated in the fact that no-one was officially designated regent for the young king during his minority between February 1327 and November 1330. However, the role was effectively taken on by his mother and Philippa’s predecessor, Isabella of France. Philippa, then, had more or less been relegated to the sidelines by her mother-in-law, because Isabella’s actions arguably demonstrated her continuing wish to act, and to be seen, as queen. The delay in arranging Philippa’s coronation, quite plausibly, was a result of Isabella’s unwillingness to cede queenship to her. 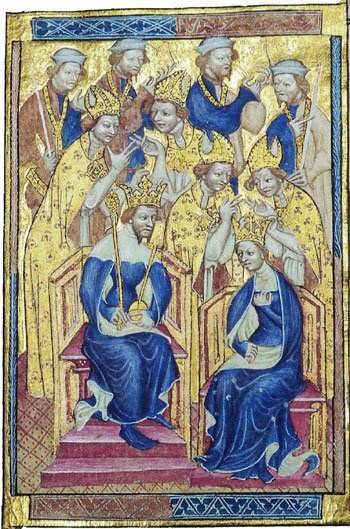 It was not an auspicious start to Philippa’s queenship, but her tenure, ending in 1369, was marked by notable successes that ultimately restored dignity – one could even, with caution, say normality – to the office of queenship. Early on, Philippa appears to have prioritised the role of intercessor, which was a shrewd political move on her behalf given the widespread discontent that had enveloped England during the final years of Edward II’s reign and the minority of Edward III as a result of unpopular political, financial and diplomatic policies. In the summer of 1331, a year after her coronation, the pope wrote to the queen thanking her for her conduct towards her mother-in-law, and beseeched her to restore ‘the good fame’ of Isabella, whose reputation had been somewhat tarnished during the regency. In her intercessory activities, there is evidence that Philippa exerted influence and was determined to redress perceived injustices. In 1350, she wrote to the chancellor requesting a commission of enquiry into the over-taxation of her tenants at Havering atte Bower, a property traditionally assigned to the queens of England. She also wrote to her attorney John de Edington instructing him to refrain from executing writs against those indebted to her, until she and her council had determined their ability to pay. In exercising influence in her household management, and in interceding for those who found themselves in a difficult situation – including her mother-in-law – Philippa conformed to contemporary expectations of queenship and how the incumbent was expected to make use of her resources and influence associated with the office in a manner that redounded to the ‘oneure’ of her husband. Indeed, so successful was Philippa perceived to be as an intercessor that it arguably became the role with which she was most associated during her lifetime and beyond. Most famously of all, in 1347 – the same year in which The III Consideracions was published – she was reported to have persuaded her husband to spare the lives of six principal burghers after the siege of Calais. Her intercessory activities occurred regularly and ranged from obtaining a pardon for an eleven-year-old girl convicted of robbery in York to requesting clemency for a pregnant woman condemned to be executed for theft. Ultimately, Philippa did not intercede as regularly as her mother-in-law, but it is nonetheless noteworthy that her perceived success as an intercessor earned her the admiration of her subjects. As Thomas Walsingham confirmed, she was ‘a most noble woman and most constant lover of the English.’ At a time when foreign-born consorts could attract criticism for their entourages – Joan of Navarre as an example – it is striking that this was not the case for Philippa. As effective as she was as an intercessor, it was ultimately in motherhood that Philippa enjoyed her greatest success. During her long marriage to Edward III , the queen gave birth to twelve children, and thus proved that she was receptive to the stipulation that the queen should seek to provide her husband with heirs ‘with al her strengthe her right sorowful grevous herte.’ Philippa’s motherhood restored a measure of stability to the kingdom in the wake of her husband’s complicated accession and the initial difficult circumstances in which she became his consort. There is, moreover, evidence that Edward appreciated his wife’s fertility. Her churchings, which accompanied childbirth, were calculated to promote the fertility of the dynasty, and the featuring of the coats of arms of both England and Hainault following the birth of their eldest son, Edward, in 1330, demonstrated that the paternal and maternal families were united in dynastic continuation. Philippa’s tenure as queen was not marked by a coup and a deposition, as her mother-in-law’s was, but her forty years as consort ultimately permitted Philippa to formulate her own conception of queenship that served the dynastic and political needs of her husband, whose accession had been made possible by his father’s deposition and possible death. In her activities as an intercessor and as a mother, Philippa’s model of queenship was more traditional than that of her predecessor and conformed closely to contemporary ideals that were predicated on gender expectations and honour codes. Her successes account for her popularity among her subjects, while her close relationship with her husband enabled her to be influential in the informal avenues of power traditionally available to the consort. If her mother-in-law’s actions had presented an ambiguous situation for Philippa, then the successful model of queenship that she had developed undoubtedly required consideration by her successors. Intercession and motherhood similarly featured during the tenure of her successor, Anne of Bohemia, the first wife of her grandson Richard II. The Coronation of Anne of Bohemia and Richard II in the Liber Regalis (Wikipedia). Like Philippa, Anne’s marriage was made in difficult circumstances, for it occurred in the context of schism within the Church. The marriage treaty promised a perpetual alliance between the English king and Anne’s brother Wenceslaus of Bohemia, but it does not appear to have been popular among Richard’s councillors. The chronicler Adam of Usk noted that Anne had been ‘bought for a great price’, and the lack of financial advantage caused resentment. Perhaps aware that her marriage was not viewed entirely positively by her new subjects, Anne soon became active in the sphere of intercession, and in this she sought to emulate her predecessor. In January 1382, the same month in which she married Richard and was crowned at Westminster Abbey, Anne met with the citizens of London and was presented with a bill soliciting her support for the city’s liberties. They encouraged her to act as ‘mediatrix’ between them and the king. Given that the so-called Peasants’ Revolt had destabilised the city less than one year earlier, it is unsurprising that the Londoners were desirous of maintaining peace in the capital. The queen, who was traditionally closely associated with mediation, was looked to in the hope of peace. Unlike her predecessor, Anne was not required to contend with a domineering mother-in-law. This enabled her to establish a close relationship with her husband, who was a similar age, and it was reported that Richard ‘rarely or never permitted Anne to be absent from his side’. This closeness meant that Anne could be effective in her intercessory activities which, as Philippa’s queenship had established, tended to be influenced, at least on one level, by the closeness between king and queen. Her activities were both necessary and valued in view of the mounting troubles that Richard faced as his reign progressed. In 1388, Anne beseeched the Appellants – the nobles determined to impeach several of the king’s favourites in a bid to restrain Richard’s perceived tyrannous rule – to save the lives of the king’s former tutor Sir Simon Burley and the justices. While her subjects may have appreciated her intercession, the queen’s marriage remained unpopular. Unlike Philippa, Anne was criticised for maintaining a conspicuous foreign entourage, and the scandal involving one of the queen’s ladies, Agnes de Launcekrona, and the king’s favourite Robert de Vere, dishonoured Anne. This apparent ineffectiveness in governing her household can be seen in the broader context of Anne’s limited success as consort. Her marriage had not been made in auspicious circumstances and its unpopularity was exacerbated by her failure to provide a male heir. Detail of a miniature of the funeral of Anne of Bohemia, at the beginning of chapter 39. Royal 18 E II f. 227v., Netherlands, S. (Bruges) (The British Library). Why Richard and Anne’s marriage proved childless has been debated by historians. It has been suggested that the couple failed to consummate the marriage and lived chastely, but there is surviving evidence that testifies to Anne’s desire to produce children. Kristen Geaman’s research has indicated that Anne purchased items associated with fertility, and the queen also ventured on a pilgrimage to pray for a son. Tragically for the royal couple, Anne was destined to remain disappointed. Her death in 1394, at the age of twenty-eight, contributed to Richard’s worsening position as king, and his deposition followed only five years later. It is tempting to speculate as to what might have happened had there been children of the marriage, but the lack of heirs led to a crisis of the succession, which further contributed to questions about Richard’s suitability to rule. What is significant is that Anne herself does not appear to have been criticised for her childlessness, unlike other queens (Henry VIII’s wives being obvious examples). Chroniclers were mixed in their views of Anne, but she was represented by one as the ‘most gracious queen of England, even though she died childless’ and she came to be perceived as a moderating influence on her unstable husband. Anne’s piety and activities as an intercessor indicated her concern for her subjects’ interests, similarly to Philippa of Hainault. Ultimately, Anne’s death placed the institution of queenship in an ambiguous position, and it was left to her successor, Isabelle of France, to attempt to restore the office to its former glory. Her youth and Richard’s deposition ensured that this never materialised. Henry IV’s accession in 1399 was made possible by contemporary criticisms of Richard’s inability to rule, and the questionable legitimacy of his kingship was closely associated with his queens’ shortcomings. While Anne enjoyed limited success, it is possible that, in her childlessness, she was more of a burden than a blessing to Richard. Contemporaries expected their queen to intercede on behalf of her subjects; clemency and mercy were highly prized virtues and allowed the king to act graciously without appearing to lose his masculine authority. Motherhood was equally expected of the consort, for it enabled the continuation of the ruling dynasty and further legitimised the king’s right to rule. Philippa of Hainault and Anne of Bohemia were praised for their activities as intercessors, and both enjoyed success in this traditional queenly activity. However, while Philippa’s fertility was celebrated by her husband and contributed to the stability of his regime, Anne’s childlessness weakened her husband’s claim to rule and at least indirectly contributed to his deposition five years after her death. Conor Byrne studied History at the University of Exeter. He is the author of Katherine Howard: A New History and Queenship in England: 1308-1485 Gender and Power in the Late Middle Ages , both published by MadeGlobal. Since 2012 he has run a historical blog and was formerly editor of Tudor Life Magazine. His research to date specialises in late medieval and early modern European history, with a focus on gender, sexuality and the monarchy.